One of the best strikers the world has ever seen, Africa’s own Samuel Eto’o is in South Africa to launch the newest version of Africa 5s. 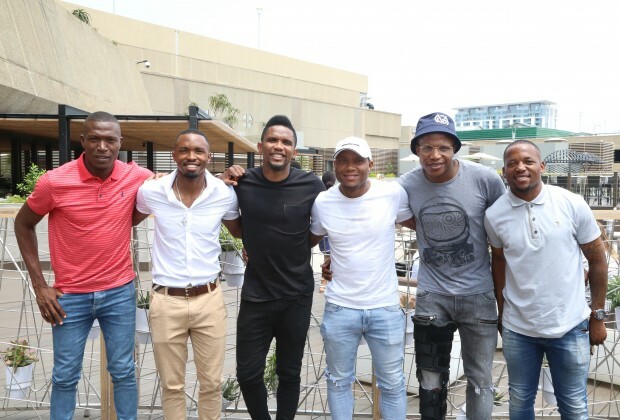 Tendai Ndoro of Highlands Park was one of five local players including Lebohang Manyama, Aubrey Ngoma, Bernard Parker and Thusa Phala who got to have lunch with Eto’o on Sunday and was blown away by meeting the world football legend. “What a huge honour to meet a genuine legend who I’ve watched play in the biggest teams in the world. Who has played in a World Cup, has played in an Afcon, has dominated on the biggest stages! And yet still so humble.” Said Ndoro. It’s not clear yet if Ndoro’s training sessions have got any shorter since this conversation with Eto’o, but it was clear that the meeting with the legend has left a huge impression. Posing in pictures and selfies and hogging tabloids is the only thing Ndoro knows best, he was always posting videos and selfies while still at Pirates and the team was being hammered 6 -0, 6-1...please let your feet do the talking in the field of play and maybe just maybe you too can be counted as a legend one day not a player who took Ajax to relegation.